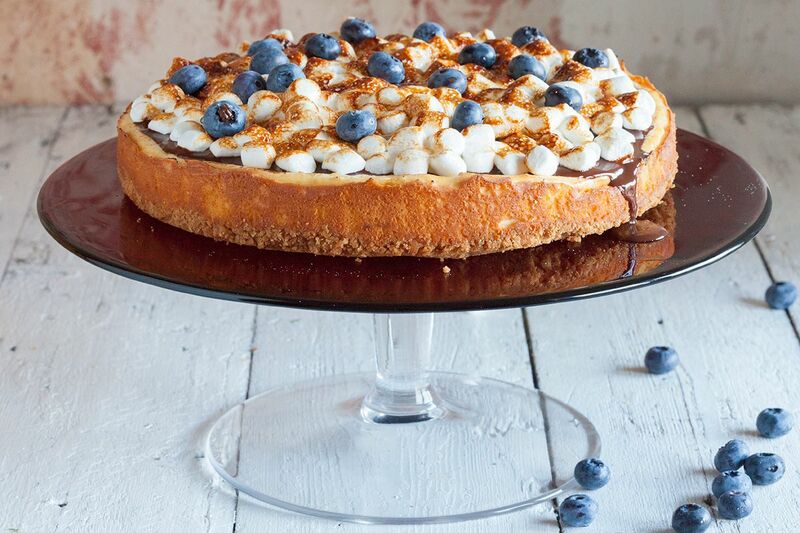 Wow, it's an amazing marshmallow and chocolate cheesecake! 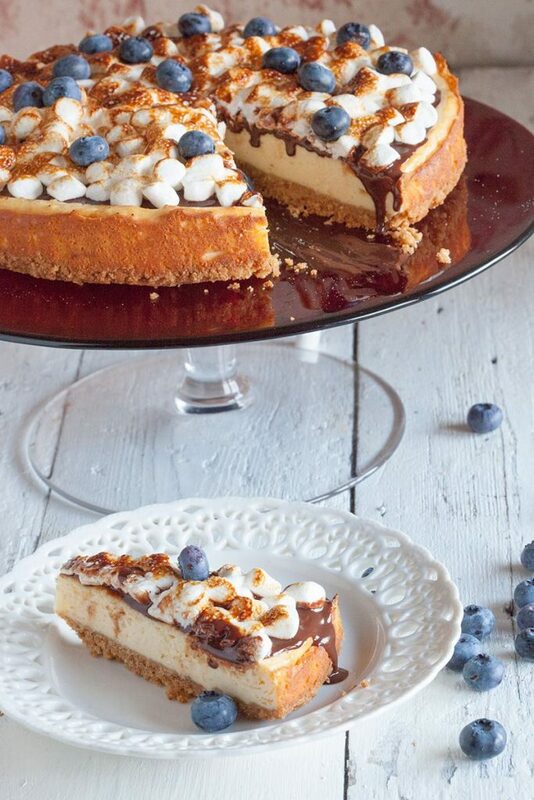 The layer of chocolate and sweet marshmallows will compliment the refreshing cheesecake. Pre-heat your oven to 150 degrees celsius or 300 degrees fahrenheit. Start by coating the spring form with butter and line with parchment paper if you prefer. Crumble the cookies either by adding it in a zip-lock bag and smashing it with a rolling-pin or simply by using a blender. Melt the butter in a small saucepan, add in the cookie crumbs and mix together. Divide the butter and cookies mixture on the bottom of the springform. Press firmly and make sure there are no holes visible. 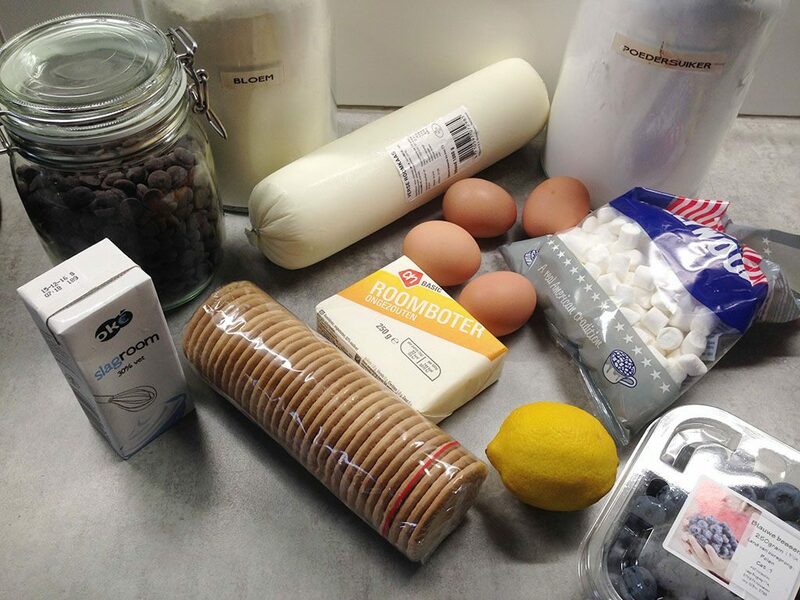 Add the cream cheese, 4 eggs, powdered sugar and the flour into the stand mixer bowl and mix on high-speed until a smooth mixture has formed. Grate the lemon and squeeze the juice from the lemon, add the lemon zest and juice to the mixture and give it a good stir. Pour the cream cheese, eggs and powdered sugar mixture over it. Add the springform into the oven for about 30 to 35 minutes, bake at a temperature of 150 degrees celsius or 300 degrees fahrenheit. When the cheesecake is done, remove from the oven and set aside to cool. Refrigerate when at room temperature. Meanwhile prepare the chocolate layer. Simply heat cream in a small saucepan and add the chocolate. Stir with a whisk until you’ve reached a smooth chocolate sauce. Let it cool off to room temperature and then pour it on top of the cooled off cheesecake. Divide the mini marshmallows on top and use a hand burner to slowly melt the marshmallows. 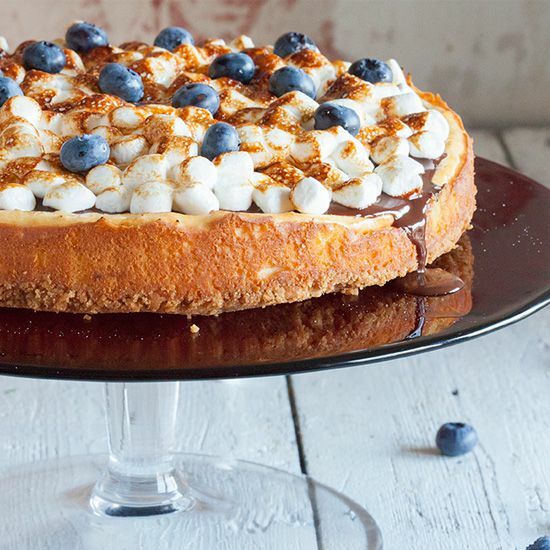 Top it off with blueberries if you like. Enjoy!